Sherry"s Stamped Treasures: New Catalogue, New Product! Woohoo! New Catalogue, New Product! Woohoo! Happy Canada Day to all my Canadian friends - I hope you have a great long weekend planned! Our daughter is heading out to go camping with a friend and her grandparents and the rest of us will be spending it with my parents at the Sherwood Park festivities and then back here for a BBQ. We are doing a late father's day celebration with my dad because he was in Austria for father's day and just got back this week. I'm sure everyone knows what today is, besides Canada day?! Today is the day the new catalogue is officially released! And it is gorgeous! With it comes a new hostess program, new in colors, new stamps, accessories, dies and so much more. It actually won't go live until noon today so I will have to come back as soon as I can to update the links. and a new patterned paper - Flirtatious Specialty paper. 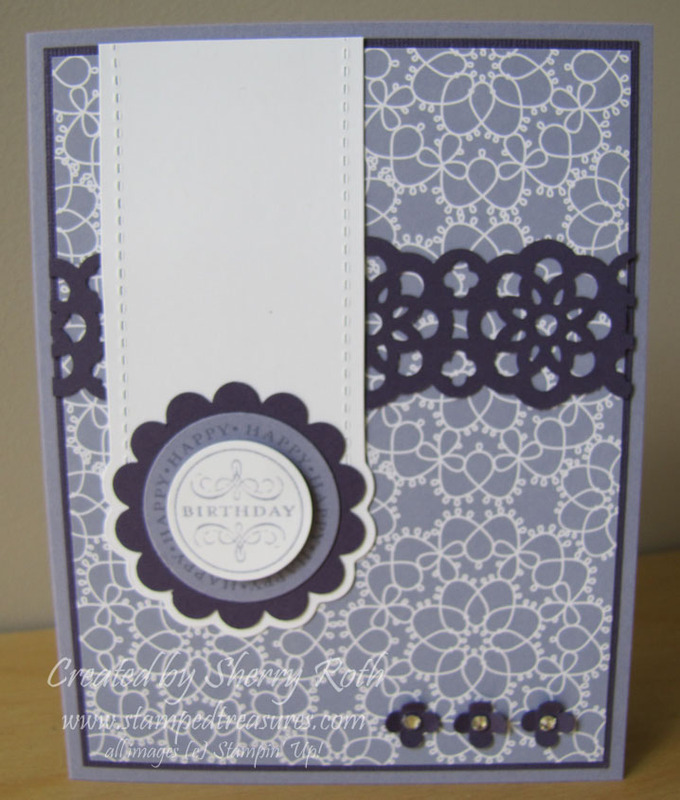 I paired the Wisteria with Elegant Eggplant for a monochromatic card. I LOVE these two colors together! 12 new hostess products including stamp sets, pattern paper, and digital content CDs. With a qualifying workshop ($200 and up, before shipping & GST), you earn hostess dollars. In addition to hostess dollars, when your workshop reaches $525, you qualify for an item at 50% off! Doesn't that sound like an incredible change? I am so excited about the new program and would love to work with you to get your workshop to a level where you will receive 1 or more full priced items at 50% off. Contact me today to find out what dates are available. I'll be back again soon to share with you some more projects created with new product!